Citi Field is a baseball park located in Flushing Meadows–Corona Park in New York City. Completed in 2009, it is the home field of the New York Mets of the National League division of Major League Baseball. The stadium was built as a replacement for and adjacent to Shea Stadium, which opened in 1964 next to the site of the 1964 New York World's Fair. Citi Field was designed by Populous (then HOK Sport), and is named after Citigroup, a New York financial services company which purchased the naming rights. The $850 million baseball park was funded with $615 million in public subsidies, including the sale of New York City municipal bonds which are to be repaid by the Mets plus interest. The payments will offset property taxes for the lifetime of the park. The Mets are receiving $20 million annually from Citibank in exchange for naming the stadium Citi Field. The first game at Citi Field was on March 29, 2009, with a college baseball game between St. John's and Georgetown. The Mets played their first two games at the ballpark on April 3 and 4, 2009 against the Boston Red Sox as charity exhibition games. The first regular season home game was played on April 13, 2009, against the San Diego Padres. Citi Field hosted the 2013 Major League Baseball All-Star Game, marking the second time the Mets have hosted the event (the first being in 1964, the inaugural season of Shea Stadium). Since the 1990s, the Mets had been looking to replace Shea Stadium. It had originally been built as a multi-purpose stadium in 1964. While it had been retrofitted as a baseball-only stadium after the NFL's New York Jets left for Giants Stadium after the 1983 season, it was still not optimized for baseball, with seating located farther away from the playing field compared to other major league ballparks. The team unveiled a preliminary model of the ballpark in 1998; it featured a retractable roof and a movable grass field, which would have allowed it to host events including conventions and college basketball. The Mets also considered moving to Mitchel Field or Belmont Park in Nassau County, Long Island; Sunnyside Yard in Queens, or the West Side Yard in Manhattan. In December 2001, shortly before leaving office, New York City Mayor Rudy Giuliani announced "tentative agreements" for both the Mets and New York Yankees to build new stadiums. Of the $1.6 billion sought for the stadiums, city and state taxpayers would pick up half the tab for construction, $800 million, along with $390 million on extra transportation. The plan also said that the teams would be allowed to keep all parking revenues, which state officials had already said they wanted to keep to compensate the state for building new garages for the teams. The teams would keep 96% of ticket revenues and 100% of all other revenues, not pay sales tax or property tax on the stadium, and would get low-cost electricity from New York state. Business officials criticized the plan as giving too much money to successful teams with little reason to move to a different city. Michael Bloomberg, who succeeded Giuliani as mayor, exercised the escape clause in the agreements to back out of both deals, saying that the city could not afford to build new stadiums for the Mets and Yankees. Bloomberg said that unbeknownst to him, Giuliani had inserted a clause in this deal which loosened the teams' leases with the city and would allow the Mets and Yankees to leave the city on 60 days' notice to find a new home elsewhere if the city backed out of the agreement. At the time, Bloomberg said that publicly funded stadiums were a poor investment. Under Bloomberg, the New York City government would only offer public financing for infrastructure improvements; the teams would have to pay for the stadiums themselves. Bloomberg called the former mayor's agreements "corporate welfare." Giuliani had already been instrumental in the construction of taxpayer-funded minor league baseball facilities MCU Park for the Mets' minor league Brooklyn Cyclones and Richmond County Bank Ballpark for the Staten Island Yankees. The final plans for what is now Citi Field were created as part of the unsuccessful New York City 2012 Olympic bid. After plans for a West Side Stadium fell through, New York looked for an alternate stadium to host the opening and closing ceremonies and track and field. The Olympic Stadium project on the West Side was estimated to cost $2.2 billion, with $300 million provided by New York City and an additional $300 million from New York State. If New York had won the bid, Citi Field would have been expanded to Olympic events while the Mets would have played at Yankee Stadium in the Bronx for the 2012 season. On March 18, 2006, the New York Mets unveiled the official model for the new ballpark. By July 2006, initial construction of the new park was underway in the parking lot beyond Shea Stadium's left-field, with a projected finish ahead of Opening Day 2009 in late March. During the 2010 offseason, the bullpen area in right-center field underwent a complete renovation. When the edifice opened in time for the start of the 2009 MLB season, the Mets' bullpen was in front of the visiting bullpen, leading to an obstructed view of the field from the visiting bullpen, which the San Diego Padres complained about during the Mets' first regular-season home series. The bullpens were turned 90°, with pitchers throwing toward the field instead of parallel to it. More Mets team colors, player banners and logos were also added throughout the ballpark, including revamping the "Let's Go Mets" slogan on the Citi Vision board so that the word "Mets" appears in its traditional script instead of the same font as the rest of the slogan. Additionally, the height of the home run boundary line directly in front of the Home Run Apple in center field was reduced from 16 feet (4.9 m) to 8 feet (2.4 m) in an attempt to produce more home runs. During its first three seasons, the large field dimensions caused Citi Field to play as an extreme "pitcher's park", and home-runs at the stadium were among the fewest in the Major Leagues. Mets' general manager Sandy Alderson changed Citi Field's dimensions in time for the 2012 MLB season in order to make it more friendly to hitters. Changes included building an 8 feet (2.4 m) wall in front of the high 16 feet (4.9 m) wall in left field that many had dubbed the "Great Wall of Flushing", removing the nook in the "Mo's Zone" in right field, and reducing the distance in right center field from 415 feet (126 m) from home plate to 390 feet (120 m). The new walls are colored blue in order to address fan complaints that the old black walls with orange trims did not reflect the colors of the Mets. The Mets have also created a new seating section located in between the old and new left field walls called the Party City Party Deck, renamed the M&M's Sweet Seats in 2016 after change of sponsorship, and can accommodate 102 additional fans. On March 21, 2019, the Mets announced on Twitter that Citi Field's permanent address will be changed to 41 Seaver Way, in honor of former Mets pitcher Tom Seaver whose number was 41. Entrance to Citi Field through the Jackie Robinson Rotunda, with Shea Stadium's Home Run Apple on the right. Citi Field has a capacity of 41,922. It has over 15,000 fewer seats than Shea Stadium. All the seats in the park are green – in an homage to the Polo Grounds, longtime home of the baseball Giants and the original home of the Mets – as opposed to Shea's orange, blue, red and green assortment. The exterior facade is reminiscent of Ebbets Field (which was long sought by Mets owner Fred Wilpon, a Brooklyn native). Citi Field's interior design is primarily influenced by PNC Park, which was the favorite ballpark of Mets COO Jeff Wilpon. Other influences include Great American Ball Park, Coors Field and Citizens Bank Park. Shea Stadium was the only ballpark in the Major Leagues to feature orange foul poles instead of the standard yellow, a unique characteristic that made its way into Citi Field. Citi Field features an overarching bridge motif in its architecture, as New York City is linked by 2,027 bridges and is reflected in the Mets logo, as the team is the symbolic bridge to the city's past National League teams, the New York Giants and the Brooklyn Dodgers. In the outfield section of the ballpark, there is a pedestrian bridge named Shea Bridge which resembles the Hell Gate Bridge. Similar to Shea Stadium, Citi Field's field dimensions make it a pitcher friendly park. The Coca-Cola Corner, originally known as the Pepsi Porch, hangs over the field in right field, extending far beyond the indentation of the Clubhouse and is inspired by Tiger Stadium's right field porch. The Pepsi sign that sat atop the area (2009-2015) was modeled after the one alongside the East River in Gantry Plaza State Park; it was replaced by Coca-Cola's logo in 2016 upon assuming the role of a Mets sponsor. Delta Air Lines signed a multiyear deal on September 15, 2008, to sponsor an exclusive section in Citi Field. The Delta Sky360 Club is a 22,500-square-foot (2,090 m2) restaurant-cafe-bar-lounge complex that also houses 1,600 premium seats behind home plate stretching from dugout to dugout. The front entrance of Citi Field features a rotunda named after Brooklyn Dodgers legend Jackie Robinson and honors his life and accomplishments. Engraved into the rotunda's 160-foot-diameter (49 m) floor and etched into the archways are words and larger-than-life images that defined Robinson's nine values: Courage, Excellence, Persistence, Justice, Teamwork, Commitment, Citizenship, Determination and Integrity. Robinson's famous quote: "A life is not important except in the impact it has on other lives", is engraved into the upper ring of the rotunda. There is also an 8-foot (2.4 m) sculpture of Robinson's number 42. The formal dedication of the Jackie Robinson Rotunda was held as part of Major League Baseball's official celebration of Jackie Robinson Day on April 15, 2009. During the 2009 season, the original Shea apple was located in Bullpen Plaza, just inside the Bullpen Gate entrance. In 2010, it was relocated to a spot outside the ballpark in Mets Plaza, the area between the Jackie Robinson Rotunda and the entrance to the Mets–Willets Point subway station. Behind the center field scoreboard is the FanFest area, an expanded family entertainment area that includes a miniature wiffleball field replica of Citi Field called Mr. Met's Kiddie Field, a batting cage, a dunk tank, video game kiosks and other attractions. Citi Field offers a wide choice of eateries. Taste of the City is a food court located in the center field section of the ballpark. It features food from restaurateur Danny Meyer's Union Square Hospitality Group and includes a variety of stands, including Shake Shack (burgers, fries, shakes), Blue Smoke (barbecue), El Verano Taqueria (Mexican cuisine), Catch of the Day (featuring seafood from chef Dave Pasternack of Esca) and Box Frites (Belgian French fries). The World's Fare Market is located on the field level in right field and features sushi from Daruma of Tokyo, sandwiches and pastries from Mama's of Corona, Chinese cuisine from Tai Pan Bakery and Korean food from Café Hanover. Citi Field also offers a choice of fresh fruit at several stands around the stadium. In 2010 Citi Field upgraded the food choices on the Promenade Level behind home plate. Blue Smoke BBQ and Box Frites both open a second location. Restaurants and clubs are also available in every level of the ballpark. The 350-seat Acela Club (now Porsche Grill) located in left field on the Excelsior Level, is the dining highlight of the new park and features a full view of the playing field as well as food from Drew Nieporent's Myriad Restaurant Group, renowned for Nobu and Tribeca Grill. Admission into the high-end luxury Porsche Grill and Delta Sky360 Club, and including the other semi-luxury clubs are exclusive to high-end ticket holders only, and some restaurants enforce that reservations be made. A McFadden's Restaurant and Saloon opened at Citi Field in 2010. It is located directly under the Good Humor FanFest and is open to the public year-round. The original Mr. Met costume is one of the many exhibits on display at the Mets Hall of Fame and Museum. The Mets Hall of Fame & Museum is located adjacent to the Jackie Robinson Rotunda on the first base side and opened on April 5, 2010. The museum includes plaques honoring the inductees of the New York Mets Hall of Fame, the team's World Series trophies from 1969 and 1986, as well as artifacts on loan from noted collectors, former players and the National Baseball Hall of Fame and Museum. The museum boasts several displays including autographed memorabilia, original scouting reports on players such as Darryl Strawberry, and handwritten notes from the team's first manager Casey Stengel. In addition to this the team has installed interactive touchscreens that guide visitors through various aspects of the franchise's 50-year history, and there are television screens and timelines that help weave all the disparate elements into a cohesive narrative. Business Insider praised the stadium for its aesthetics and named it one of the top 100 venues in sports, while BaseballParks.com called it "perfect" and especially lauded the Jackie Robinson Rotunda. Reviewers have also praised the many culinary offerings at Citi Field's concession stands. During its first three seasons in existence, Citi Field was known to play as a "pitcher's park", and has been cited as the cause of the decreased offensive production of David Wright and Jason Bay. Wright hit only 10 home runs in 2009 after hitting at least 30 in the previous two seasons, while Bay had the worst offensive production of his career in his first season with the Mets in 2010, only hitting 6 home runs, 47 RBIs, and OBP of just .347, and a slugging percentage of a career-low .402. Jeff Francoeur, who played with the Mets during their first two years at Citi Field, criticized the ballpark's dimensions, calling it "a damn joke." During the 2011 season, Citi Field allowed 1.33 home runs per game, the third lowest total out of the 16 National League ballparks. The team responded by altering the ballpark dimensions for the 2012 season, creating a more neutral ballpark. Wright's 2012 offensive numbers have improved due to the alterations. "It's a huge difference", Wright said. "It allows you to relax and know you don't have to try to hit the ball a mile to see results. And at the same time, if you do hit the ball well and you see results, instead of a 400-foot flyout, you're 1-for-1 and feeling good about yourself." Citi Field is serviced by the IRT Flushing Line at the Mets – Willets Point station. Citi Field is located in the borough of Queens, adjacent to the neighborhoods of Corona, which lies to its west, and Willets Point and Flushing to the east. 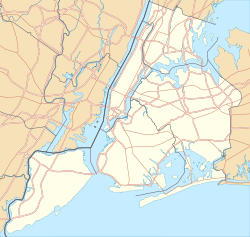 Flushing Bay is to the north, and the rest of Flushing Meadows–Corona Park is to the south. Because it lies within the Flushing postal zone, and because of its location in Flushing Meadows–Corona Park, Citi Field is frequently referred to as being in Flushing proper. Citi Field is accessible via the New York City Subway via the IRT Flushing Line (7 and <7>​ trains) at the Mets–Willets Point station, and the Long Island Rail Road station on the Port Washington Branch also called Mets–Willets Point. New York Water Taxi operates a free ferry to the stadium from Pier 11/Wall Street and the East 34th Street Ferry Landing before every game. For selected games, SeaStreak provides ferry service between Highlands, New Jersey and the stadium. Both ferry services use the slips at the World's Fair Marina, located approximately 0.25 miles (0.40 km) north of Citi Field. The park is also close to several major thoroughfares, including the Grand Central Parkway, the Whitestone and Van Wyck Expressways, the Long Island Expressway, Roosevelt Avenue, Northern Boulevard and Astoria Boulevard. Citi Field is near to the USTA Billie Jean King National Tennis Center, where the annual US Open grand-slam tennis tournament is held. On November 13, 2006, it was announced that the ballpark would be called Citi Field, named for Citigroup Inc. Citigroup will be paying $20 million a year for the naming rights to the park over the next 20 years. This made Citi Field the second major league sports venue in the New York metropolitan area and the first in the city itself to be named for a corporate sponsor. At the time, the Meadowlands Arena in New Jersey's Meadowlands Sports Complex had carried the Continental Airlines name; since then Prudential Center in Newark, MetLife Stadium in East Rutherford, Red Bull Arena in Harrison, and Barclays Center in Brooklyn have all opened under corporate sponsorship. The deal includes an option on both sides to extend the contract to 40 years, and is the most expensive sports-stadium naming rights agreement ever, subsequently equaled by MetLife Stadium's $400 million deal. At the groundbreaking for Citi Field, it was announced that the main entrance, modeled on the one in Brooklyn's old Ebbets Field, would be called the Jackie Robinson Rotunda, possibly due to campaigns to forgo naming rights revenue and name the ballpark after Robinson. The Mets are spending more than $600 million for the new ballpark, which New York City and New York state are also supporting with a total of $165 million for such costs as infrastructure and site preparation. On February 24, 2008, the Mets and Citigroup unveiled the new Citi Field logo. Both Citigroup and the Mets maintain that the naming rights deal is secure, despite Citigroup's economic troubles. This deal has been criticized in light of the late-2000s financial crisis and the $45 billion of taxpayer funds allocated to Citigroup by the U.S. federal government in two separate rescue packages, prompting New York City Council members Vincent Ignizio and James Oddo to suggest that the new ballpark be called "Citi/Taxpayer Field." Radio talk show host Brian Lehrer suggested the name "Debits Field" which combines baseball history with public outrage over the Citi bailout. Congressman Elijah Cummings of Maryland, who serves on the United States House Committee on Oversight and Government Reform, stated in regards to the Citi Field naming rights deal, "This type of spending is indefensible and unacceptable to Citigroup's new partner and largest investor: the American taxpayer.... I strongly urge Citigroup to find a way out of this contract and instead spend that $400 million on retaining its employees and restoring confidence in its operations." On January 29, 2009, congressmen Dennis Kucinich of Ohio and Ted Poe of Texas sent a letter to United States Secretary of the Treasury Timothy F. Geithner urging him to scrap Citigroup's $400 million naming rights deal. "We request that you intervene and demand that Citigroup dissolve the agreement they have with the New York Mets," reads the letter. "Absent this outcome, we feel strongly that you should compel Citigroup to return immediately all federal monies received to date, as well as cancel all loan guarantees." However, Geithner rejected congressional demands to cancel the naming rights deal. The Wall Street Journal reported on February 3, 2009, that Citigroup considered breaking the naming rights deal. Citi has stated that no government TARP funds would be used in the sponsorship deal. The naming rights controversy reemerged when details about owner Fred Wilpon's involvement in Bernard Madoff's Ponzi scheme came to light when a lawsuit was filed on behalf of victims of Madoff's investment scandal in 2011. April 13, 2009 – In the first Mets game ever played at Citi Field, Jody Gerut of the San Diego Padres hit a home run off Mike Pelfrey as the first batter of the game, becoming the first player in Major League Baseball history to open a ballpark with a leadoff home run. April 17, 2009 – Gary Sheffield hit his 500th home run against the Milwaukee Brewers, becoming the first player to reach this milestone as a pinch hitter. It was Sheffield's first home run as a Met, which made Sheffield the first player to hit number 500 as his first home run with a new team. September 11, 2011 – Citi Field hosted a nationally televised game against the Chicago Cubs to mark the tenth anniversary of the attacks of that day in 2001. The pregame ceremonies featured members of the 2001 team who played at Shea Stadium on September 21, 2001, the first major sporting event held in New York City since the attacks. June 1, 2012 – Johan Santana threw the first no-hitter in Mets franchise history in an 8-0 victory over the St. Louis Cardinals, ending a 50-year drought, the longest in Major League Baseball. July 16, 2013 – Citi Field hosted the 2013 Major League Baseball All-Star Game, with the American League defeating the National League 3-0. The attendance of 45,186 was the largest in Citi Field's history. June 9, 2015 – Chris Heston of the San Francisco Giants threw a no-hitter in a 5-0 victory over the Mets. October 3, 2015 – Max Scherzer of the Washington Nationals threw a no-hitter in a 2-0 victory over the Mets, becoming the fifth pitcher in major league history to throw two no hitters in a season. October 12, 2015 – Citi Field hosted its first playoff game, with the Mets defeating the Los Angeles Dodgers 13-7 in Game 3 of the 2015 NLDS. October 30, 2015 – Citi Field hosted its first World Series game, with the Mets defeating the Kansas City Royals 9-3 in Game 3 of the 2015 World Series. November 1, 2015 – The Kansas City Royals won the 2015 World Series, their first World Series championship since the 1985 World Series with a 7-2 Game 5 victory over the Mets in 12 innings. July 30, 2016 - In a pre-game ceremony before a 7-2 loss to the Colorado Rockies, Mike Piazza's #31 was retired, only the second time in club history that the Mets retired a player's number. October 5, 2016 - The San Francisco Giants defeated the Mets 3-0 in the 2016 National League Wild Card Game. September 11–13, 2017 - A three-game series between the New York Yankees and Tampa Bay Rays was moved from Tropicana Field to Citi Field due to Hurricane Irma. The Rays were the "home" team for this series because the games were supposed to be played in Tropicana Field. These were the first Major League Baseball games to be played at Citi Field that did not involve the New York Mets. Additionally, these were the first games played in Flushing under AL rules (excluding the 2013 All-Star Game) since April 1998, when the Yankees played a "home" game at Shea Stadium, after a beam caused structural damage at the original Yankee Stadium, and during the 1974 and 1975 seasons, while Yankee Stadium was being renovated. January 1, 2018 - The 10th Annual NHL Winter Classic was held at Citi Field between the New York Rangers and the Buffalo Sabres. The Rangers defeated the Sabres 3-2 in Overtime. Paul Carey, Michael Grabner, and J.T. Miller scored for the Rangers, while Sam Reinhardt, and Rasmus Ristolainen scored for the Sabres. On June 7, 2015, the first "Legends of Wrestling" event took place at Citi Field. It was a professional wrestling event, featuring veteran wrestlers such as Rob Van Dam, Lita, The Nasty Boys, Scott Steiner, and many more independent professional wrestlers, in up to six matches taking place; the event was headlined by Ric Flair, Bret "The Hitman" Hart, and Bill Goldberg. On November 7, 2015, Citi Field hosted the first game of the Cricket All-Stars Series 2015, featuring many retired cricket players from around the world and led by great cricket legends Sachin Tendulkar and Shane Warne. Warne's Warriors defeated Sachin's Blasters by 6 wickets. On January 1, 2018, Citi Field hosted the 2018 NHL Winter Classic between the New York Rangers and the Buffalo Sabres. The Rangers won the game 3-2 in overtime. The Sabres were the designated home team for the game, as the Rangers' home arena of Madison Square Garden would lose its property tax exemption from the City of New York if any Rangers home games are not played there. Following the Winter Classic, Citi Field, with the help of Recycle Track Systems, the waste, recycling, and sustainability partner of the New York Mets, was able to recycle the hockey rink that was used during the game. Citi Field was featured in the finale of the third season of Ugly Betty. Citi Field was also featured as a location in the film Sharknado 2: The Second One, in which a tornado filled with sharks hits the ballpark. The field was featured in the CSI: NY Episode Hammer Down during the CSI: Trilogy, a three-night crossover event between CSI: Crime Scene Investigation, CSI: Miami and CSI: NY. The location also featured in the upcoming film, Avengers: Endgame, first seen in the Super Bowl TV commercial. ^ The Mets lease the ballpark through a sub-company known as Queens Ballpark Company LLC (see Queens Ballpark Company financial report). That's because the land the ballpark was built on is owned by New York City and is leased to the Mets. The company is in charge of managing the lease and making sure it is paid on time each year. ^ a b Belson, Ken; Sandomir, Richard (April 3, 2012). "Mets Hope New Design at Citi Field Brings Back the Long Ball". The New York Times. Retrieved April 4, 2012. ^ "American 3, National 0". MLB.com. July 16, 2013. Retrieved July 16, 2013. ^ "Boxscore: Kansas City vs. New York, Game 3". October 24, 2015. Retrieved October 24, 2015. ^ a b c Smilow, Jeffrey; Thompson, Allen (August 2009). "New Era in New York" (PDF). Modern Steel Construction. Archived from the original (PDF) on December 26, 2011. Retrieved September 19, 2011. ^ Bagli, Charles V. (November 4, 2008). "As Stadiums Rise, So Do Costs to Taxpayers". The New York Times. Retrieved January 9, 2010. ^ Bagli, Charles V. (December 8, 2008). "As Stadiums' Costs Rise, City Agrees to New Bond Offerings". The New York Times. Retrieved January 9, 2010. ^ Robinson, Joshua (March 29, 2009). "Fans Savor Sneak Peek of Citi Field, Even if Mets Aren't There". The New York Times. Retrieved February 25, 2010. ^ DiComo, Anthony (May 16, 2012). "Mets to Host 2013 All-Star Game at Citi. Field". Mets.com. Archived from the original on May 23, 2012. Retrieved May 16, 2012. ^ Sandomir, Richard (April 24, 1998). "Mets Unveil Model Stadium: Its Roof Moves, as Does Grass". The New York Times. Retrieved May 21, 2010. ^ a b "Bonus Season for Baseball". The New York Times. January 17, 2002. Retrieved October 3, 2009. ^ a b c d Bagli, Charles V. (January 16, 2002). "Bloomberg Says Details On Stadiums Were Omitted". The New York Times. Retrieved October 3, 2009. ^ Levy, Nicole; Chiwaya, Nigel (August 16, 2016). "How NYC's Failed 2012 Olympic Bid Shaped the City We Live in Today". DNAinfo.com. Archived from the original on August 17, 2016. Retrieved August 17, 2016. ^ Bloom, Barry M. (September 27, 2008). "Citi Field Nearing Completion". MLB.com. Archived from the original on March 20, 2012. Retrieved October 6, 2009. ^ Shpigel, Ben (December 2, 2008). "Citi Field Starting to Look Like a Real Ballpark". The New York Times. Retrieved December 3, 2008. ^ Costa, Brian (November 13, 2009). "Mets Renovating Bullpen Area at Citi Field". The Star-Ledger. Newark. Retrieved November 13, 2009. ^ a b "Mets Expand Club Presence at Citi Field" (Press release). New York Mets. November 21, 2009. Archived from the original on January 11, 2016. Retrieved November 22, 2009. ^ Rubin, Adam (February 9, 2010). "Mets' Citi Field to Become More Homer-Friendly Next Season; Center-Field Wall Gets Chopped to 8 Feet". Daily News. New York. Retrieved February 9, 2010. ^ Puma, Mike (September 21, 2011). "Mets Ready to Move Citi Field Fences". New York Post. Retrieved September 21, 2011. ^ a b Rubin, Adam (October 21, 2011). "Source: Citi Field changes on tap". ESPNNewYork.com. Retrieved October 21, 2011. ^ Puma, Mike; Paterson, Blake; Perez, Chris (21 March 2019). "Mets' Tom Seaver honors begin with Citi Field address". nypost.com. New York Post. Retrieved 22 March 2019. Citi Field’s permanent address will become 41 Seaver Way for the jersey number Tom Terrific wore, the sources said. ^ a b c d e "Citi Field – The Amazin' New Ballpark". Daily News. New York. August 26, 2009. Archived from the original on May 9, 2009. Retrieved July 9, 2010. ^ Price, Bill (April 12, 2009). "Pepsi Porch Great for Mets Fans, but Maybe Not for Ryan Church". Daily News. New York. Retrieved October 3, 2009. ^ Collins, Glenn (March 24, 2009). "For Mets Fans, a Menu Beyond Peanuts and Cracker Jack". The New York Times. Retrieved March 24, 2009. ^ "Robinson family, Mets, Citi, Jackie Robinson Foundation, Major League Baseball, Government Leaders Dedicate Jackie Robinson Rotunda at Citi Field" (Press release). New York Mets. April 15, 2009. Archived from the original on June 15, 2011. Retrieved October 6, 2009. ^ "Two MN Companies Keep Baseball Tradition Alive". KEYC-TV News. January 20, 2009. Archived from the original on January 24, 2009. Retrieved October 6, 2009. ^ Albanese, Laura (March 26, 2010). "Home Run Apple A Core Value for Mets Fans". Newsday. Retrieved March 27, 2010. ^ "Citi Field Information: A-to-Z Guide". New York Mets. Retrieved September 3, 2011. ^ "Citi Field Fan Map: Field Level". New York Mets. Retrieved September 3, 2011. ^ a b "Mets and Aramark Unveil All-Star Dining Line-up for 2010 at Citi Field" (Press release). New York Mets. March 24, 2010. Archived from the original on May 11, 2010. Retrieved March 26, 2010. ^ Miller, Dan (September 23, 2009). "Mets Unveil Asian, Korean and Chinese Food Samples at CitiField World's Fair Market". The Queens Gazette. Retrieved March 26, 2010. ^ Fernandez, Manny (August 29, 2009). "Buy Me Some Peanuts and Nectarines". The New York Times. Retrieved October 3, 2009. ^ "McFadden's Restaurant and Saloon To Open at Citi Field" (Press release). New York Mets. February 25, 2010. Archived from the original on April 3, 2012. Retrieved February 5, 2012. ^ "Welcome – McFadden's Ballpark NY". Mcfaddenscitifield.com. Retrieved September 3, 2011. ^ "Mets Hall of Fame & Museum opens this Monday, April 5, Opening Day at Citi Field" (Press release). New York Mets. April 1, 2010. Archived from the original on June 15, 2011. Retrieved April 2, 2010. ^ Nachman, Corey (June 9, 2011). "The 100 Best Venues In Sports" Archived March 4, 2016, at the Wayback Machine. Business Insider. ^ Sin, Yvo (July 12, 2013). "The 9 Best Eats At Citi Field, 2013" Archived June 11, 2012, at the Wayback Machine. CBS News. ^ Castellano, Rob (May 17, 2011). "Citi Field Food: A Taste Of The Citi" Archived March 15, 2016, at the Wayback Machine. SB Nation. ^ Castellano, Rob (April 2, 2012). "An In-Depth Look At The Newest Options In Citi Field Food" Archived March 15, 2016, at the Wayback Machine. SB Nation. ^ Strang, Katie (April 13, 2009). "Many Fans Unhappy With Bad Views at Citi Field". Newsday. Retrieved October 3, 2009. ^ Herrmann, Mark (July 13, 2009). "A Tale of Two New Ballparks". Newsday. Retrieved October 3, 2009. ^ Hirshon, Nicholas (April 20, 2009). "Shea hey, fans protest: Mets faithful say new Citi Field pays too much tribute to Ebbets". Daily News. New York. Retrieved July 10, 2012. ^ Toobin, Jeffrey (May 30, 2011). "Madoff's Curveball". The New Yorker. Retrieved 2012-07-10. ^ Rubin, Adam (August 14, 2009). "Mets Adding More Mets to Citi Field". Daily News. New York. Archived from the original on August 19, 2009. Retrieved October 6, 2009. ^ Schreiber, Jay (May 11, 2010). "Citi Field's Fingerprints All Over Wright's and Bay's Numbers". The New York Times. Retrieved May 12, 2010. ^ DiComo, Adam (January 1, 2011). "New Mets Regime Ready for Year of Change". MLB.com. Retrieved January 5, 2011. ^ McCarron, Anthony (January 22, 2011). "Former Met Jeff Francoeur, Now With Royals, Calls Citi Field 'A Damn Joke'; Mets Get Bullpen Help". Daily News. New York. Retrieved January 22, 2011. ^ Harper, John (July 7, 2012). "David Wright's spectacular 2012 campaign started in Port St. Lucie, Fla., where he found time to reevaluate swing". Daily News. New York. Retrieved July 10, 2012. ^ "Delta Mets Baseball Taxi". New York Water Taxi. Archived from the original on November 26, 2011. Retrieved December 18, 2011. ^ "Mets Honor Robinson at New Home". Daily News. New York. November 14, 2006. Archived from the original on April 27, 2007. Retrieved November 14, 2006. ^ Brown, Maury (November 22, 2008). "Amidst Near Collapse, Cititgroup Confirms Retaining Naming Rights Deal with Mets". The Biz of Baseball. Archived from the original on December 16, 2008. Retrieved November 22, 2008. ^ "Pols Want New Name for Mets Home: Citi/Taxpayer Field". USA Today. November 26, 2008. Retrieved November 26, 2008. ^ Das, Andrew (December 5, 2008). "Citi Field by Any Other Name, Part II". The New York Times. Retrieved April 14, 2010. ^ Irwin, Neil (November 24, 2008). "U.S. Offers Citigroup Expansive Safety Net". The Washington Post. Retrieved November 24, 2008. ^ Cummings, Elijah (November 14, 2008). "Citigroup's Spending Indefensible and Unacceptable". The Huffington Post. Retrieved November 25, 2008. ^ Nasaw, Daniel (November 25, 2008). "Baseball Stadium Named for Citigroup Faces Scrutiny". The Guardian. London. Retrieved November 25, 2008. ^ Herbert, Keith (January 30, 2009). "Pols Call for Mets to Scrap Citigroup Naming Rights Deal". Newsday. Retrieved January 30, 2009. ^ Grim, Ryan (January 29, 2009). "Rename Citi Field: Bipartisan Push In House". The Huffington Post. Retrieved January 30, 2009. ^ Sisk, Richard (February 13, 2009). "Mets Fans Will Have to Deal With Citi Field As Name of Stadium, Says Rep. Barney Frank". Daily News. New York. Retrieved October 3, 2009. ^ Enrich, David; Futterman, Matthew; Paletta, Damian (February 3, 2009). "Citi Explores Breaking Mets Deal". The Wall Street Journal. Retrieved February 3, 2009. ^ Haberman, Clyde (February 7, 2011). "At Citi Field, Stains Are Not From the Grass". The New York Times. Retrieved February 8, 2011. ^ Gagne, Matt (April 14, 2009). "Padres' Jody Gerut Opens Citi Field With a Bang, Homering on Third Pitch". Daily News. New York. Retrieved June 26, 2009. ^ Ghiroli, Brittany (April 18, 2009). "Sheffield Joins Elite Club With No. 500". MLB.com. Retrieved June 26, 2009. ^ Waldstein, David (September 29, 2009). "Burnett Looks Sharp as He Prepares for First Postseason". The New York Times. Retrieved October 3, 2009. ^ DiComo, Anthony; Taube, Aaron (August 31, 2011). "Franco, Piazza Set for First Pitch on Sept. 11". MLB.com. Mets.MLB.com. Archived from the original on October 9, 2012. Retrieved September 4, 2011. ^ "Mets' Ceremony Honors 9/11". MLB.com. September 11, 2011. Retrieved September 29, 2011. ^ Miller, Steven (June 1, 2012). "No-han! Santana twirls first no-no in Mets history". MLB.com. Retrieved June 1, 2012. ^ "Santana no-no a long time coming for Mets". ESPN. June 1, 2012. Retrieved June 2, 2012. ^ "BTS Makes Impressive Citi Field Debut". ^ "Lacrosse Box Score (Final)". Holy Cross. March 17, 2013. Archived from the original on April 3, 2015. Retrieved March 17, 2013. ^ "Colgate 10 vs Michigan 7". Colgate. March 17, 2013. Retrieved March 17, 2013. ^ "Sabres 'hosting' 2018 Winter Classic vs. Rangers reportedly saves MSG $40M". cbssports.com. May 12, 2017. Retrieved August 2, 2017. ^ "RTS starts Citi Field contract by recycling a hockey rink". WasteDive. January 3, 2018. Retrieved June 4, 2018. ^ "A Mets game is postponed by a sharknado in 'Sharknado. 2'". USA Today. July 29, 2014. Retrieved July 30, 2014. Wikimedia Commons has media related to Citi Field. Belson, Ken & Sandomir, Richard. "Mets' New Home Is the 'Anti-Shea'," The New York Times, March 5, 2009.